The ex-lead guitarist of the Coral shows yet again what a talented musician and songwriter he is. One of the most talented, versatile -- and arguably underrated -- British bands of the last 15 years are the Coral. On an “indefinite break” since 2012, their six studio albums (plus 2014’s psych-folk The Curse of Love, actually an album recorded in 2006 that the band had decided to shelve) evidenced an ability to mix up folk, psychedelia and roots but retain a groove all of their own. Above all, the Coral had clearly inherited that north-west England/Liverpool gene, possessed by bands from the Beatles to honorary Scousers Teardrop Explodes to the La's, that of producing sublime pop music with a twist. The Coral’s lead guitarist for most of that period was the precocious Bill Ryder-Jones. Despite leaving the band before their finest hour (the extraordinary golden-chorded adrenaline rush of Butterfly House) Ryder-Jones had shown enough, for example through his orchestral arrangements for the band, to suggest that here was a potentially highly gifted musician not afraid to experiment and put himself out of his comfort zone. Perhaps he was indeed one of the driving forces behind the Coral’s early eclecticism as Butterfly House, for all its melodic glories, also implied a band ditching a maverick nature for one that had “matured”. Bill Ryder-Jones is a serious young man who has had to cope with mental health problems, which seem to have been the primary reason for him leaving his old bunch of mates from the Coral. But his solo career to date has also continued down a catholic path: his first solo album If was an adaptation of a novel; second solo venture A Bad Wind Blows In My Heart a collection of haunting mainly acoustic meditations on inner feelings and emotions; he has written film scores; and he has recorded with the Royal Liverpool Philharmonic. If in particular presented on full beam Ryder-Jones's symphonic and dramatic ambitions -- a piano and strings-based soundtrack that varied between The Lord of the Rings and The Road in mood and sweep. Ryder-Jones’s new album, West Kirby County Primary, has been marketed as a rockier, more aggressive aesthetic. To record West Kirby, Ryder-Jones reportedly relocated to his old bedroom in his mother’s house. The atmosphere in the songs reflects that of the lone troubadour in a bedsit, but it also has the feel of an introspective, brooding soul gazing out of his window on to windswept seascapes. Take the opener "Tell Me You Don’t Love Me", where Ryder-Jones’s husky tones confide in us that he always gets his own way and that he’s an only child. But he doesn’t seek our sympathy: this is a proud and assertive “I’ll go my own way” manifesto. The late, great Elliott Smith was a standard-bearer for the lonely and vulnerable, and at two least of this album’s track -- "Catherine and Huskisson", and "Two to Birkenhead" -- resemble songs from Smith’s posthumous 2004 record From a Basement on the Hill. Ryder-Jones is not as pure a singer as Smith, but his aching, yearning air and the melancholy chord structures recall some of the singer-songwriter’s most touching music. Ryder-Jones is apparently one of Noel Gallagher’s favourite guitarists. Given the marketing emphasis on West Kirby being a heavier, full band experience than any of his solo recordings hitherto, the album doesn’t showcase his instrumental prowess as much as might be expected. The average, samey "You Can’t Hide a Light With the Dark" is the song that disappoints most on this theme of Bill the guitar hero. Thankfully, the next track "Satellites" makes a strong case for the defence: a squalling reach for the sky beast. "West Ryder" then concludes on the most personal note of this really quite intriguing collection of material: the pastoral "Seabirds", where Ryder-Jones sounds like he is sat back on his bed, looking out of his window, whispering of a lingering search for his love. 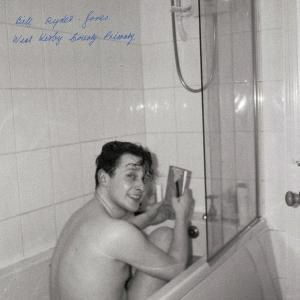 West Kirby County Primary is not an overly long album; but it does leave you wanting more and wondering where this intense music-maker from Hoylake will go next. The material on show may be uneven, but there is more than adequate promise and sheer ability to make you think that one day Bill Ryder-Jones may deliver an absolute masterpiece.